"MINIATURE HOTEL ROOMS" COMING TO AIRPORTS, TRAIN STATIONS! 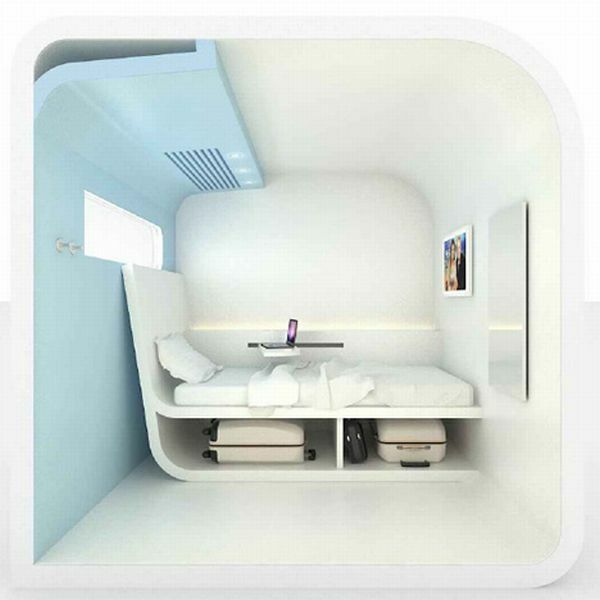 DREAM AND FLY, a Spanish company, has developed capsules that look like miniature hotel rooms. The firm intends to sell and install these capsules at airports and train stations. They're very small: The "Simply Bubble," for example is five square meters in size, and has no bathroom; the "Single Bubble," seven square meters, includes a bathroom; the largest, the "Family Bubble," offers a baby cot and a bathroom. The "Bubbles" are intended for transit passengers who'd welcome some privacy while they relax or nap between flights. According to Dream and Fly, the product is eco-firnely, economical, and easy to install. CRUISE SHIP VERSUS ASSISTED LIVING, NURSING HOME? According to a recent report, living on a cruise ship might be a less expensive--and certainly more entertaining!--alternative to assisted living facilities or nursing homes. Think about it: The services on a cruise ship--anytime meals, physician access, cabin services--are at least equal to the best amenities in a senior housing facility. Doctor Lee Lindquist, instructor of medicine at Northwestern University's Feinberg School of Medicine, obsererves that a cruise ship "could be considered a floating assisted living facility. "Seniors who enjoy travel, have good or excellent cognitive function and require some assistance with activities of daily living are the ideal candidates for cruise ship care," Lindquist says.